Beets are some of the most nutritious foods on the planet! Not only are they loaded with fiber, minerals, and vitamins, but they’re rich in antioxidants and phytochemicals. Beets are one of the most underestimated veggies, and few people eat as much of these healthy roots as they should. Want to get more beetroot in your life? Check out the following beet juice recipes below to see a few simple, tasty way to make beets into a juice that will rock your world! Here’s an interesting video, showing how to make beetroot juice without juicer. This tasty beetroot juice recipe combines the sweetness of beets with tangy ginger and rich apple juice. You get A LOT of fiber in this tasty drink, making it the perfect beverage to curb your appetite mid-morning. Plus, ginger has awesome anti-bacterial and anti-viral properties that will boost your immunity and keep you healthy! If you have a juicer, run the beetroot and the ginger piece through it. If you have a juicer, run the beetroot Cut the apples into quarters, remove the cores, and peel the apples. Throw the quarters into the juicer, and mix the apple juice in with the beet and ginger juice. Add a bit of ice to make the juice cold, and enjoy!and the ginger piece through it. With this drink, you get a double dose of Vitamin A, the vitamin that keeps your eyes and skin healthy. Beets are loaded with beta-carotene, and the bright orange carrots you add into the juice will increase the dose of Vitamin A. Adding oranges into the mix will give it a tangy flavor, but you’ll also get lots of Vitamin C.
This drink is PERFECT to start off your morning, and it’s a great source of long-lasting energy! Plus, you get a good deal of hunger-quashing fiber, ideal to help you make it through the morning without a grumbling stomach. Run the beetroot and the carrots through the juicer, extracting the liquid goodness into your cup. Cut the oranges in half, and use an orange squeezer to extract the juice. Drop in a few cubes of ice, and stir! This drink is perfect for those who want to get a healthy dose of antioxidants in their day. 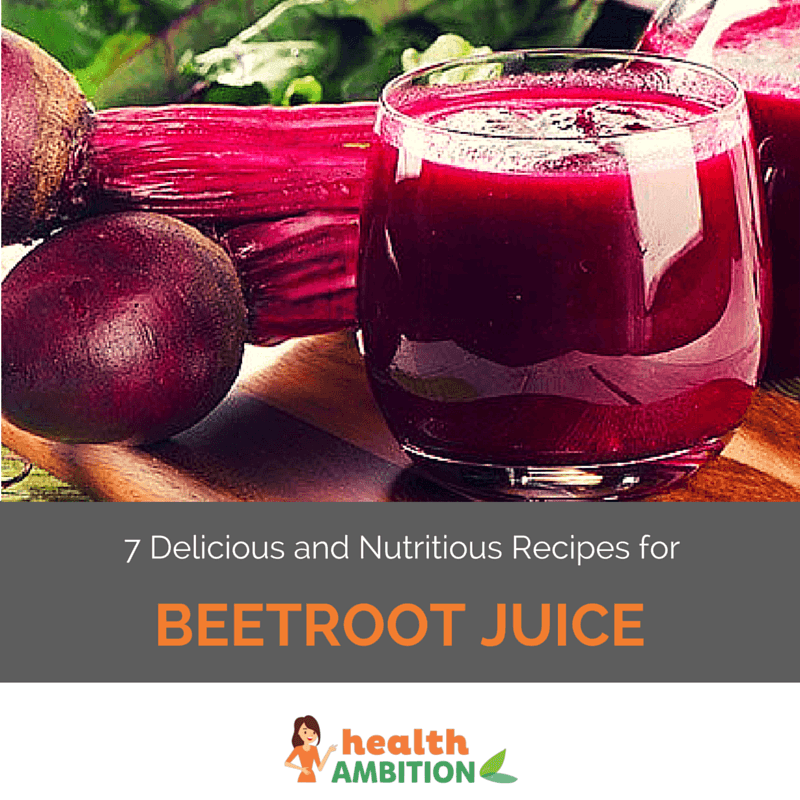 The dark purple fruits and veggies added into this beetroot juice recipe makes it a powerful punch of vital nutrients that your body needs, including flavonoids, phytochemicals, and betalains. All in all, it’s a health-boosting drink that will keep you going! Drink this juice mid-afternoon as a pick-me-up for when you are feeling dozy. You’ll find that the drink is loaded with energy thanks to the sugar from the grapes, the plums, and the beets, but the fiber in the juice will help to release the energy over time. Peel the beetroot and run it through your juicer, along with the dark purple grapes. Pour the juice into a cup, along with plenty of ice. Use a knife to peel the plum, leaving only the flesh. Cut the stone from the heart of the plum, and drop the halves into the juicer. This is going to be one of the strangest drinks you’ve ever tried, and yet one of the tastiest of all! The combination of tangy lime and earthy beetroot will make for a wonderful beet juice recipe, one that you can enjoy at any time of the day. This juice is ideal for those hot days when you want something cold and filling to drink. The Vitamin C from the limes will speed up fat burning. Thanks to the dose of Vitamin A you get from the beets, you can protect your skin from the damage done by the sun. Add half a cup of water and plenty of ice, along with a bit of sugar or honey to make the juice sweet. Run the beetroot through the juicer, pouring the juice into the cup with the lime and water. Who doesn’t love the mixture of pineapples and coconuts–the classic pina colada? You may not want to add alcohol into this drink, but it’s definitely a good one to have handy for those days when you want something exotic, cold, and refreshing to serve to guests. You’ll find that the taste of the pineapple and coconut blocks out most of the earthy flavor of the beetroot, but the natural sweetness of the beets enhances the drink’s natural flavors. It makes for a wonderfully exotic beverage, one packed with vitamins, antioxidants, and healthy fats. Cut the pineapple in pieces, and run half of it through the juicer. Pour the pineapple juice into a cup, add the ice, and stir it around to make it nice and cold. Run the beetroot through the juicer, and pour it into the cup. Get your raw coconut meat–which should be soft, from a young coconut–and run it through the juicer. Stir the juices until you have a nice, smooth drink! With this drink, you get A LOT of powerful antioxidants. Strawberries are one of the best sources of Vitamin C, which will help to boost your immune system and improve the health of your skin. The blueberries and beets will give you more antioxidants, and you get the pectin from the apple juice to add to the detoxification of your body. For a post-workout drink, you can’t beat this. You get rid of the toxins released by fat burning, refuel your muscles, and speed up recovery with this tasty beet juice recipe. Cut the strawberries in half and put them into the juicer along with the blueberries. Run the beet root and the apple through the juicer, and pour the all of the juices into a cup. Add in the ice and stir until your chilled shake is ready to drink. This drink is not for the faint of heart! It’s perfect for those who need to eat more raw foods, but who just can’t bring themselves to eat more salad or soup. It’s made with ONLYvegetables, so it’s not going to be as sweet or tasty as the other drinks above. This recipe is loaded with healthy nutrients, such as folic acid from the kale, antioxidants from the beets, and Vitamin A from the carrots. With a bit of celery to add a tangy flavor, it’s a powerful veggie shake! To begin, run the beetroot and the carrots through the juicer. Run the celery through the juicer as well, and pour the celery juice into the cup with the beet and carrot juice. Follow it up with the spinach, add ice, and drink if you can! Of all the juices on this list, I’d have to say my personal favorite is the Purple Cream Limeade. There’s something amazing about this creamy lemonade, with the perfect mixture of sweetness, rich flavor, and the earthy flavor of beets. It’s my perfect drink for a hot day by the pool. Which of the beet juice recipes above is your favorite? Leave a comment below letting us know which you enjoy the most.